Part Native Hawaiian and raised on Maui, Aaron Ahue graduated from H.P. Baldwin High School in 1997. He served six years in the United States Army, receiving an Honorable Discharge in 2007, as a microwave systems maintainer and operator in the communication field, with the rank of specialist (E-4). 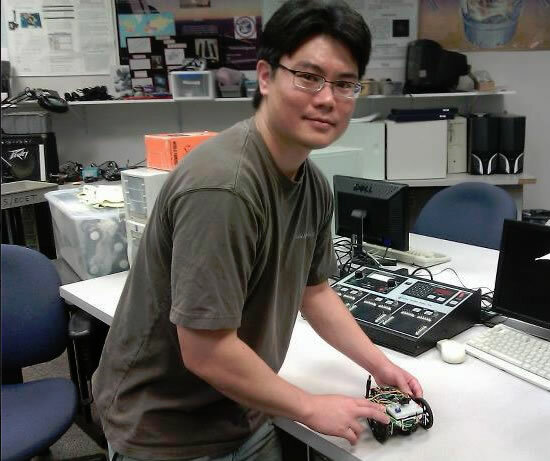 With the completion of his Akamai internship, Aaron will earn his Associate degree in the Electronics & Computer Engineering Technology (ECET) program at UH Maui College, where he will to continue on with the Bachelor’s degree program in Engineering Technology. He plans to pursue a career in the engineering and electronics field here on Maui. There is a need for a 14-inch telescope to support daylight data collection. In order to do this, a device known as a chopper has been implemented into the telescope system. The chopper is capable of applying small offsets in the telescope’s line-of-sight by controlling the tilt of a window in the optical path. The chopper also has the ability to provide real-time interrupts to the system if a user deems it necessary to make adjustments. We have developed the chopper device to incorporate two digital servos controlled by an Arduino Uno microcontroller. The first task of this project was to build all of the necessary hardware components for the Arduino and the servo housing units. Then the Arduino was programmed to support multiple states of operations by controlling the servos to give the proper positions of alignment. In addition, we have developed a graphical user interface (GUI), which provides a user the ability to interrupt the system via an easy-to-use interface. Testing of the chopper unit has been conducted before being incorporated into the telescope system. Based on these test results, additional functionality of both the chopper and its GUI will be addressed in future development.